Ok so getting this "resting hummingbird" picture was hard. Really quite a bit harder than I imagined it would be; harder than it seemed like it should be. To back up a bit, I have wanted to take a picture of a hummingbird for a long time. They are one of the most magical birds, swooping in and flying by before you hardly have a chance to take a look. I think they keep themselves mysterious that way. I guess that's why I wanted the picture so much. Now my criteria for getting a "good" picture of a hummingbird were as follows: not blurry, close enough to see the colors on the feathers (mostly because I wanted to see the colors myself- they normally move too fast for the naked eye) and nothing messy in the background. Now as a photographer these seemed like reasonable requirements. Maybe this would not be so hard. But I soon learned that just because I wanted a picture of a hummingbird, does not automatically make the bird available. No, unfortunately the hummingbird could give two hoots whether it keeps its portrait appointment or not. Now I should be clear - I don't actually know much about hummingbirds, or birds in general. But I decided if I wanted that picture then I better start paying attention to when and where I saw them. This turned out to be: (a) whenever I had no camera available (not even an iPhone camera), (b) whenever I had no time and (c) they stayed in one place so fleetingly that I had no chance of remedying either item (a) or (b). One day I was in my backyard in early evening when a hummingbird flew right past my ear. I could hear its wings in a way I had never heard before. It visited several of the brightly colored flowers in the garden and then flew back and hovered for a moment right in front of me. It then landed and sat tantalizingly close and it sat there for a while. Ok I thought - on the one hand I was finally getting a good look at this little guy so I didn't want to cut short the experience. On the other hand I really wanted that picture. I slowly backed away, went to the house, got my camera and returned; but of course no bird. I waited around for another good 30 minutes. Still no bird. I pretended to be busy pulling weeds (like I was doing when it first flew up). Nope. Nothing. Ok but now I HAD to get this picture. 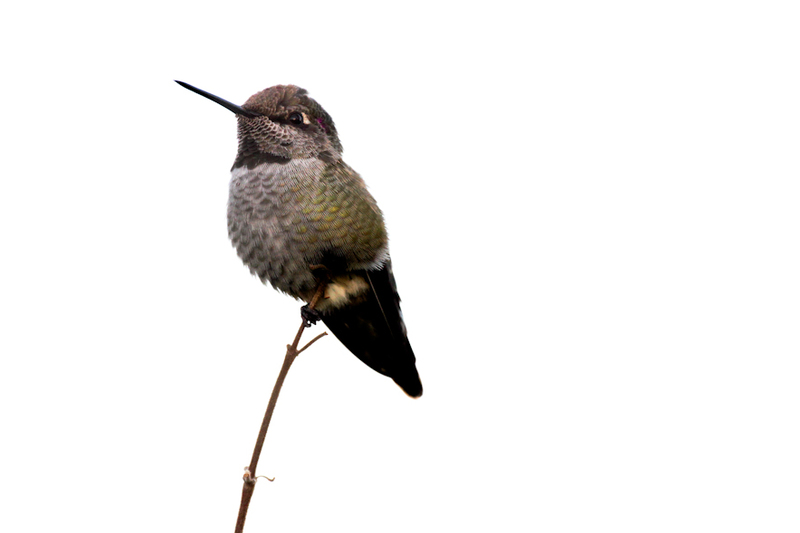 The following weekend I looked out my window and saw a few hummingbirds flying around the garden. This time I had time AND a camera. And lights. I decided I needed to use my studio lights to try to meet my "good picture" criteria. I dragged them, along with their extension cords, into the backyard. I set up a camera on a tripod and focused it on their favorite flowers. All the while I was doing this, no hummingbirds appeared. "That's ok" I thought. “Once I sit down and stop moving they will come back out.” So I sat down with my camera remote…and sat and sat …and sat. Not one bird still. I pulled up a lawn chair and I got a book to maximize my patience. Still no bird appeared. Various neighbors in my apartment building walked by and looked at me strangely then asked "what on earth are you doing?" Still no bird. Finally, I gave up. I coiled all the lighting cords and the extension cords and collapsed the tripods and umbrellas. I packed each item of gear back into its carry bag. After several trips, I hauled all the gear back inside. I then looked out the window and what do I see visiting the flowers? Hummingbirds! I repeated this process on several more occasions. I had all but given up. A few weeks later I was visiting the master gardener’s demo garden at Quarry Lakes in Fremont. I was busy photographing beautiful selections of colorful sages (one of hummingbirds’ favorite plants). After photographing for 45 minutes or so I started noticing hummingbirds everywhere. They flew between all the sages and the oak trees. It was dusk. I kept watching for a while. I noticed they had a favorite spot: a little dead twig that emerged from the top of a sage plant. It was the only place (besides in the trees) that I saw them land. I got as close as I possibly could to that twig and I waited with my non-zoom lens. Finally, I actually got a picture of a hummingbird! Still, the image did not meet my criteria but at least I got a picture. This was a big step in the right direction. I also noticed that the light was pretty good (even sans studio lighting), and the background was nothing but sky (no clutter). This was worth going home, getting a zoom lens, a remote and a tripod. I returned the following evening to the twig. I set up the tripod, the zoom lens and the remote. I waited no more than 5 minutes before the birds appeared. That evening, I got lots of pictures of several different hummingbirds who landed on that lonely twig. Now if only I could repeat this method….